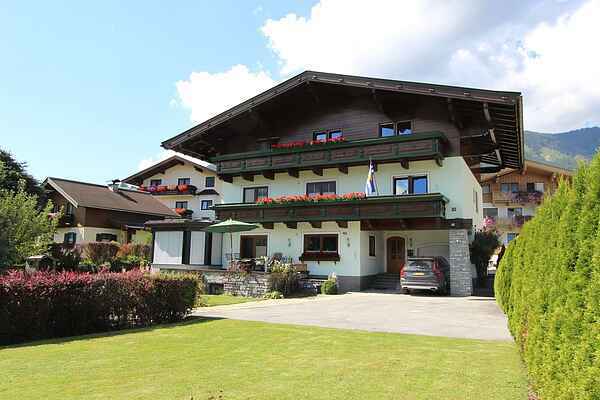 In the sunny village of Walchen, a short car drive away from famous Zell am See and Kaprun, you'll find this beautiful and particularly spacious holiday home, situated on the second floor of the house. The holiday home has no fewer than 3 bedrooms, all of which have a renovated bathroom. The living room with open kitchen features a neat and cosy interior. At the front of the house there is a large, south-facing balcony offering magnificent views. The owner has a large garden on the ground floor and part of it can be used by guests. Walchen/Piesendorf offers anything you may need during your holiday. Many shopping opportunities and restaurants. Plenty of hiking options and directly located by the Tauernradweg. In winter it has its own skiing area, ideal for beginning skiers and families. Additionally, due to the central location in the Salzburgerland, most of the sights are within easy reach. The supermarkt is a one minute walk from the guesthouse, the busstop a 1,5 minute walk and the trainstation is about 5 minutes. In winter you can rent your ski equipment for far better prices at Skischule Entleitner in Piesendorf and Walchen when you are a guest of Haus Zeeland.